Here's a delicious veggie dish and dip from Food Magazine! It is simple to make, flavorful and healthy. Even the children loved it! Actually, the original recipe used brocolli, but I substituted watercress since I have lots in the fridge, courtesy of my mother-in-law. I was afraid they might spoil easily, so I experimented and used watercress. It turned out ok! I assume this dip is so versatile you can use almost any vegetable like carrots or radishes or asparagus, celery and even mushrooms! 1. Bring salted water to a boil in a large wok or pot. 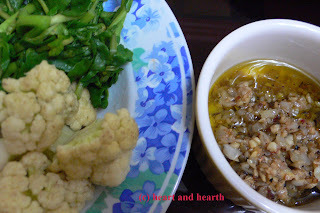 Blanch the cauliflower florets and watercress separately. Do not overcook. 2. Immediately pluge the vegetables in cold water as soon as they are cooked to maintain crispiness. Dish up. 1. Heat a small amount of olive oil in a saucepan over medium heat. Saute onions until golden. 2. Stir in garlic and anchovies. Remove from heat. All the rest of the olive oil. Season with salt and pepper. 3. Serve as a vegetable dip.